Turkey is exotic. It has been so for centuries — millennia even — becoming in Western European minds the very definition of “the other.” Its exoticness, though, is of a particularly beguiling quality. There is just enough that is familiar to raise the comfort level. Istanbul is, after all, in Europe. I know. I checked the maps. And yet things are not the same as in Europe. The religion is not the same, the language is a bit impenetrable, the smells are different and there is – at every turn – a reminder that this is not Western Europe. It is exhilarating. Istanbul is one of the world’s great cities. It is also one of the world’s most beautiful cities. 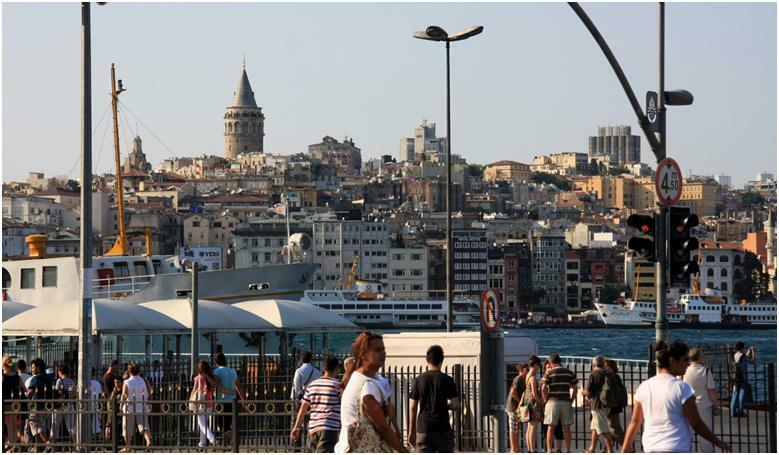 With hilly, watery sightlines reminiscent of San Francisco, great monuments around every corner and a good public transportation system, Istanbul is an easy visit. The ins and outs of the Hagia Sophia, the Blue Mosque, Topkapi Palace, the Grand Bazaar, the Spice Market and others is well documented and readily accessible in any guidebook. And these great monuments are what they are cracked up to be. They will not disappoint. And yet Istanbul is not, by any means, all of Turkey. Any trip to Turkey ought to include excursions onto the Asian stretches of the country, its Mediterranean and Anatolia zones. Some of the more popular – and publicized – options include trips to Ephesus (the great – and extremely well maintained — Greek and Roman city) or Cappadocia. We enjoyed Ephesus and will most certainly visit Cappadocia when next we travel to Turkey. 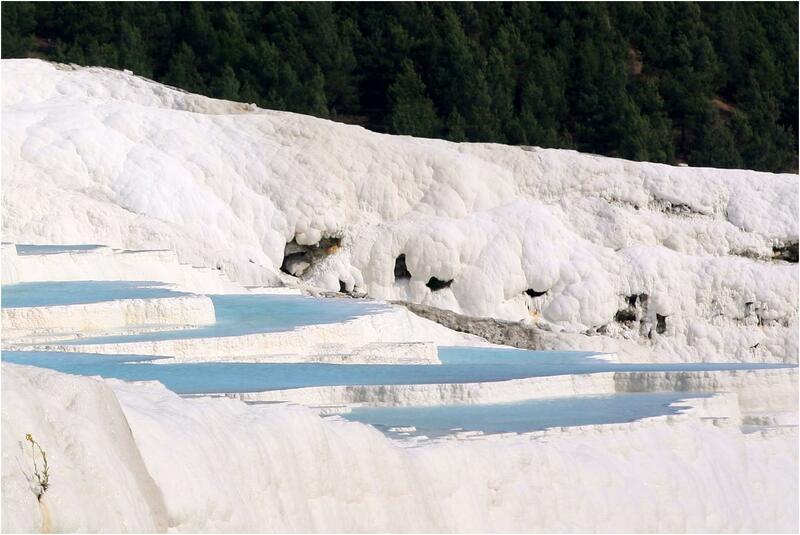 But the place that took our breath away was Pamukkale. The city is built near the location of the ancient Greek and Roman city, Hieropolis, which was built at the site of a natural hot spring on a hill 200 meters above the surrounding valley. 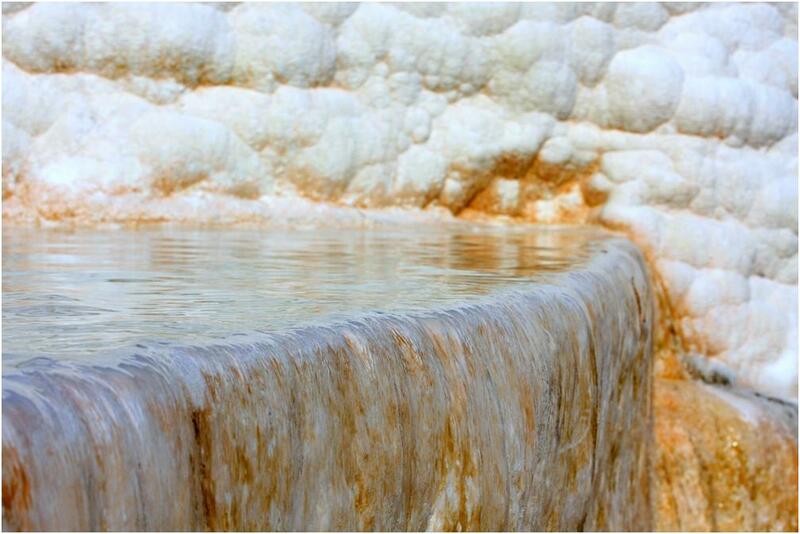 As the waters from those hot springs, supersaturated with calcium carbonate, reach the surface they release their carbon dioxide depositing calcium carbonate. 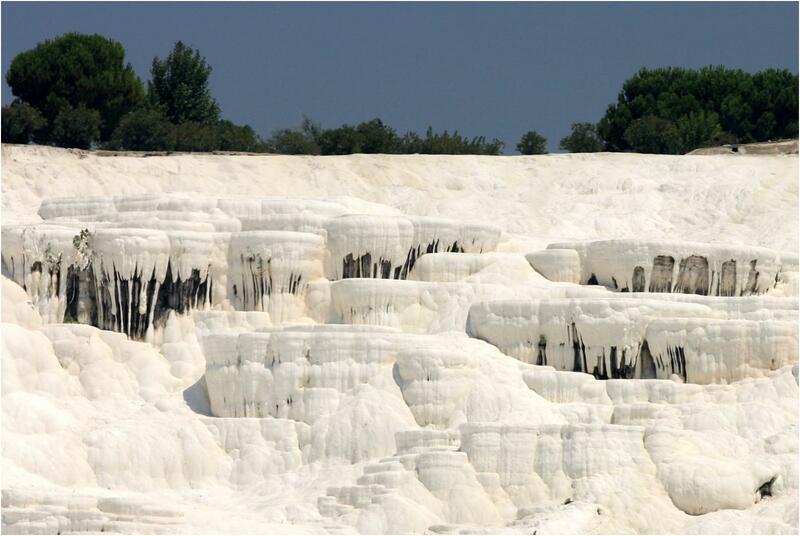 The deposition of the calcium carbonate continues until the carbon dioxide in the water balances the carbon dioxide in the air. Initially, the calcium carbonate is deposited by the water as a soft jelly. Eventually, though it hardens into travertine. The look of the place is as if Roger Dean – the artist best known for his Yes album covers – chose to work in ice sculptures. And as you approach Pammakule that is what it looks like: ice! It isn’t. In fact, the water is bathtub warm. Sadly, like so many wondrous places, Pammakule is crowded. In an odd way, though, the tour guides provide some assistance. 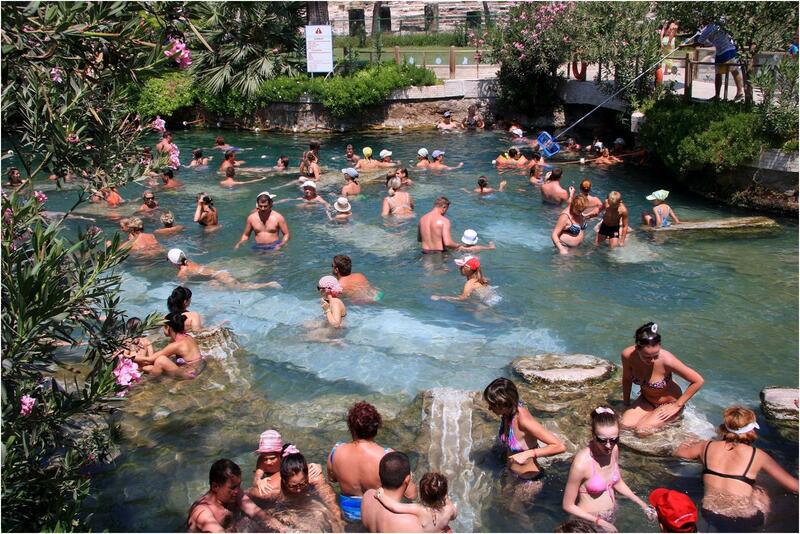 For whatever reason – perhaps the pecuniary betterment of the proprietors – they try to guide you to “Cleopatra’s Pool” (Marc Antony supposedly gave Hieropolis to Cleopatra as a wedding present), a very expensive and very crowded hot spring pool above the travertines in the old city of Hieropolis. 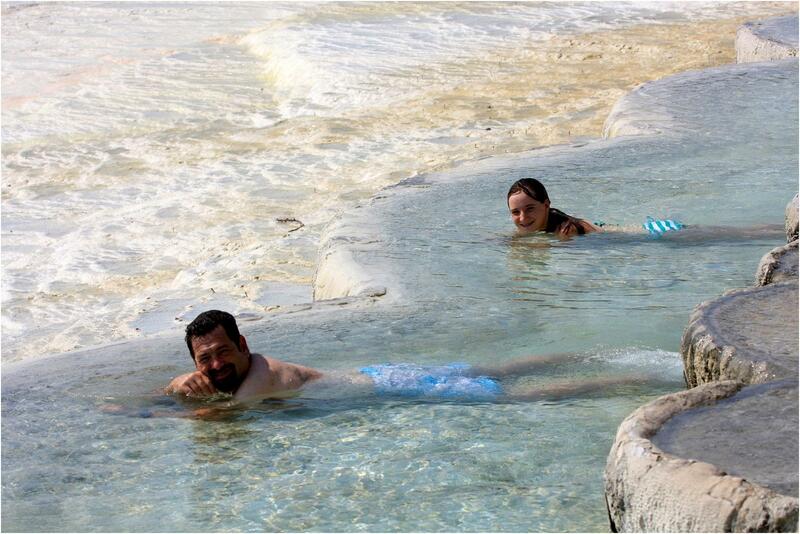 The more we thought about Cleopatra’s pool, the less we wanted to get in. What we wanted was to spend some time enjoying the beauty of Pammakule. And yet the guides kept pointing us to the trail down through the pools to the exit. Of course, I realized, these were the same guides who had been pointing us to Cleopatra’s pool. We went the other way, toward a sparsely peopled corner to the left of where the guides had been sending us right. You tell me which of those two options looks more attractive. While the history of Hieropolis is interesting (and those guides will tell you all about it), it is not that history that makes the place worth the overnight bus ride and a UNESCO World Heritage site. Rather, it is the spectacular, even sensual beauty of the place. I have never seen anything like it. Words like “breathtaking” describe it but perhaps are overused. How many places, though, have the power to fill you with a child-like giddiness? 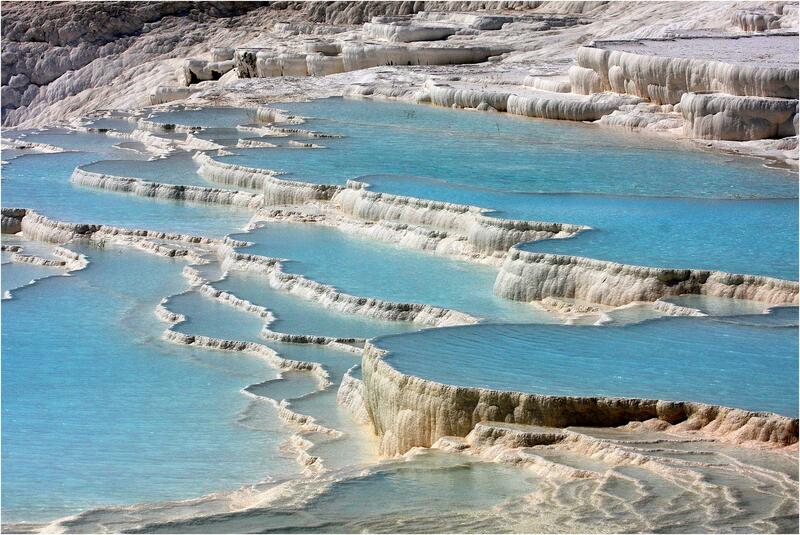 Pammukale is one of them.